The positives and negatives about your brand in two clicks. Across news sites, social media platforms, blogs and forums, customers are responding to what companies are doing every minute, but do we really know what they are saying? As professionals we have all come across buzz monitoring or sentiment analysis tools to help us uncover the weak signals from the strong ones, but how usable are they? You could be a trader looking for a quick and timely overview on the company you’re about to invest in, or a researcher wanting to understand the current landscape around a brand, the requirement for a tool that is usable and time efficient will be the same in most cases. That’s where Good News Vs. Bad News can help. 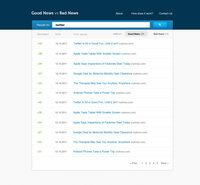 GoodNews Vs BadNews is a free browser-based app that enables marketers, publishers and businesspeople alike to discover the positive and negative sentiments around their brand. The user interface could not be more intuitive. Simply input your brand keyword into the search field and Good News vs. Bad News will crawl the web for positive and negative news items and present the headlines back to you with links to the original items. Good News Bad News’ ability to discern between positive and negative sentiment is jaw-droppingly accurate. The algorithms powering the app are as a result of over 20 years worth of research and development in the areas of linguistics, IT and computer science by one of the world’s leading content analysis and linguistic technology providers-Connexor. Traditionally an enterprise and customs solutions provider, Connexor has established itself firmly as an authority in the field with a client list that includes Microsoft, SAS, Toshiba, Nokia, General Electric and Pearson Education. Connexor’s state of the art text analysis technology powering Good News vs. Bad News uses a range of text analyses, including morphological analysis, syntactic analysis, event detection, topic detection and sentiment detection. These methods are combined to extract higher-level metadata which ensure that the topic of the text is indeed the company or brand in question. From there, the application then determines which pieces of text are positive and which are negative. 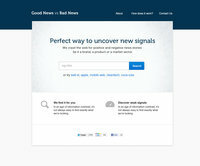 Good News Vs Bad News is available to try in beta mode here. No sign-up is required.